Blade of Light is the ninth novel and latest in the long-running series featuring Inspector Montalbano. 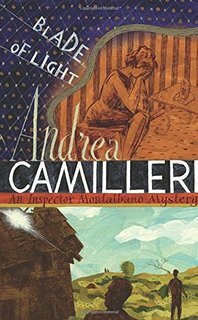 In each of these novels, Inspector Montalbano and his colleagues in Vigata, Scilly are confronted with a series of complicated and bizarre mysteries to solve. In this novel Montalbano is asked by the owner of a local supermarket to investigate a carjacking and assault on his wife. When he begins to investigate none of the witnesses’ stories add up, and he feels that they are not meant to. A body turns up, showing all the signs of a Mafia hit, except the mafia deny involvement. He is simultaneously being pursued by a mysterious gallery owner called Marian, and asked by a local farmer to investigate the appearance and almost immediate disappearance of a door on a derelict shed on his land. As in all of these novels nothing is what it seems, with the people involved giving conflicting and confusing stories about the events that have taken place. However, we also have a personal dimension in this novel, involving Francisco the boy we originally met in the snack thief, who is now grown-up. Salvo and Livia took him in, with a view to adopting him, but soon lost contact with him. He now re-appears in an unexpected way. Inspector Montalbano is the head of the Vigata police, and is frequently seen wading through never-ending piles of paperwork, and is only too happy to be asked to leave his office to investigate crimes. What makes Inspector Montalbano so effective is his ability to balance between these two opposite factions; it is not always an easy task but he has a knack of keeping everyone happy. There is a core group of characters who appear in each of these novels alongside Montalbano. His long distance partner Livia, his cook and housekeeper Adeline, creator of wonderful meals, which are waiting for him at home in the evening. His colleagues Mimi Augello, Catarella the switchboard operator who has problems with people’s names, and Fazio. It is always enjoyable to meet up with them again in each book. I like the way in which these characters develop from book to book, even characters such as Fazio and Catarella who start off as stereotypes. His relationship with Livia has evolved over the course of the novels, and in this novel is bitter sweet and elegiac. The other characters in the book are always interesting, often eccentric. The plots of all of these books are very strong and intricate, in which seemingly bizarre and random events, are gradually revealed as part of a grand plan, which Montalbano and his colleagues eventually solve. There is a lot of humour in both this novel, and the others in the series. I particularly like the setting of Sicily which is very much a character in the books, which is accompanied with hard criticism of both the Italian and Sicilian political and social situations. I also enjoy reading the descriptions of Montalbano’s meals, although these descriptions have become less lavish over the years, which is a shame. I enjoyed the novel a great deal, however I would not recommend that anyone who hasn’t read any of the series should start with this one. Instead they should start with one of the earlier novels in the series, such as The Snack Thief.